As proven in every crime drama, beauty can be lethally deceptive. So it is, too, on the docks of Cape Cod and the SouthCoast of Massachusetts. 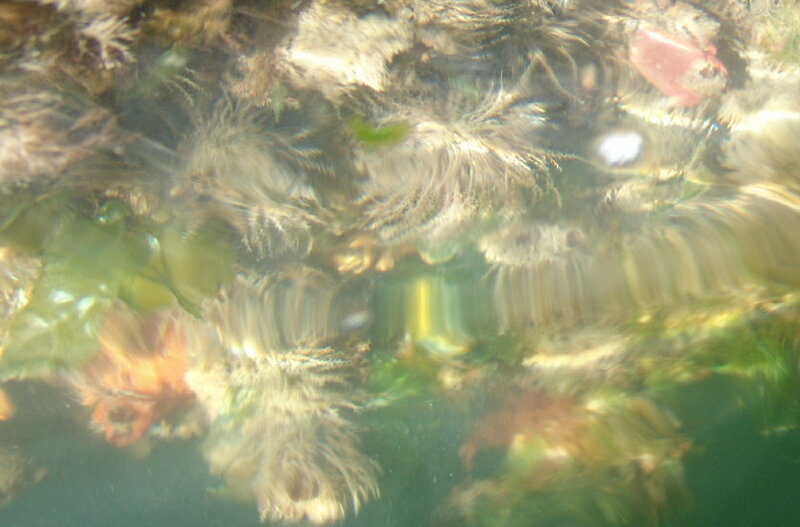 From a blurry distance as seen through thick estuarine water, fouling communities enwrapping marine structures appear rainbow beautiful. So different from our youthful memories when docks were adorned with less colorful, but much more productive and edible species, today the waterfront is dominated by exotic critters that are gourmet delicacies only in the avant-gard restaurants of the very, very Far East. 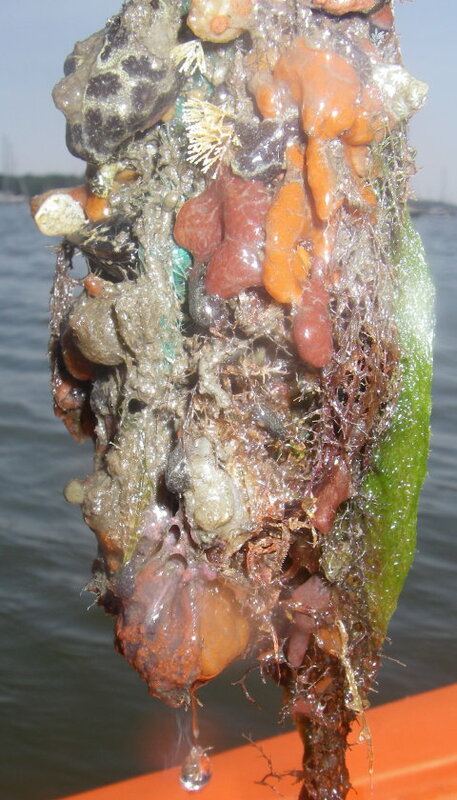 A quick visual survey of the fouling community along Tabor Academy’s Hoyt Dock (above) showed a large variety of exotic critters: tunicates (Botrylloides diagensis) and club tunicates (Styela clava), hydroids (Obelia geniculata), red bearded sponges (Microciona prolifera), worms, crumb of bread sponge (Halidrondria panacea or Halidrondria bowerbanki), and barnacles (Balanus balanoides), among others. A sample collected from the same dock in summer shows an even greater variety of species. We will address many of these species in future posts, especially the exotic and invasive tunicates. For today’s story, we focus on the Northern Rock Barnacle, a ubiquitous animal within the inter-tidal zone. 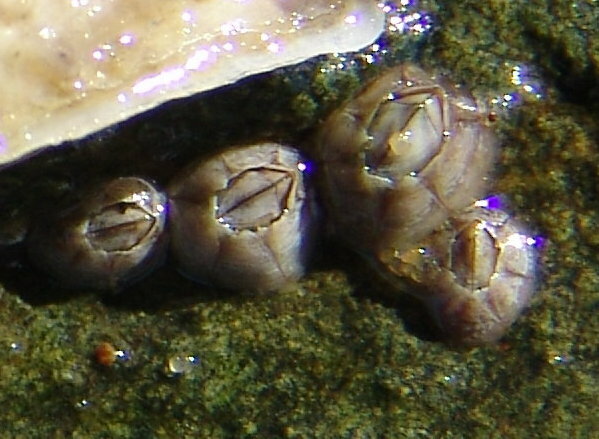 Barnacles inhabit rocky shores, forming a grayish white “barnacle zone.” They’re found among inter-tidal fouling communities in harbors and protected embayments. You find them on rocks, docks, piers, pilings, oysters, clams, shells, hermit crabs, whelks and really any hard, permanent surface. They also live on more mobile surfaces such as boat bottoms, turtles, whales and horseshoe crabs. Let’s start with the confusing stuff. What we think of as the barnacle isn’t. The barnacle is actually a shrimp-like, soft bodied animal that stands on its head and extends its six pairs of ”feet” (called “cirri”) to catch food like a cast net. What we think of as the barnacle is the animals “home” and consist of a hard, many plated shell composed of calcium carbonate that is affixed to a hard, permanent substrate with a natural superglue. This barnacle glue has been researched extensively because it’s extremely strong, sets quickly under water, withstands high pressures, resists both high acidity and alkalinity … and is completely natural. 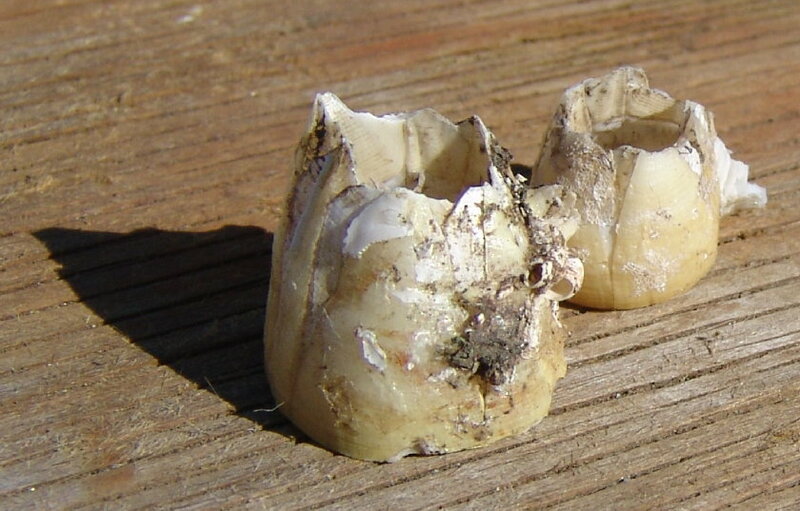 What baby-boomers wouldn’t give to have barnacle glue for their dentures! As you can see in the video clip, the top plates of the barnacle’s home open for feeding and the animal, standing on its head, casts out its six pairs of feet (cirri) into the shape of what seems like a cast net to capture food particles. They consume zooplankton such as copepods and phytoplankton such as diatoms. When the “net” is drawn back, food is scraped off the cirri into the animal’s mouth. Those top plates close tightly to seal the soft-bodied animal inside and to protect it from succumbing to desiccation during low tide and from being attacked by predators. Predators include dogwinkles (dog whelks), seastars, marine worms, fish, and periwinkles that consume small barnacles. 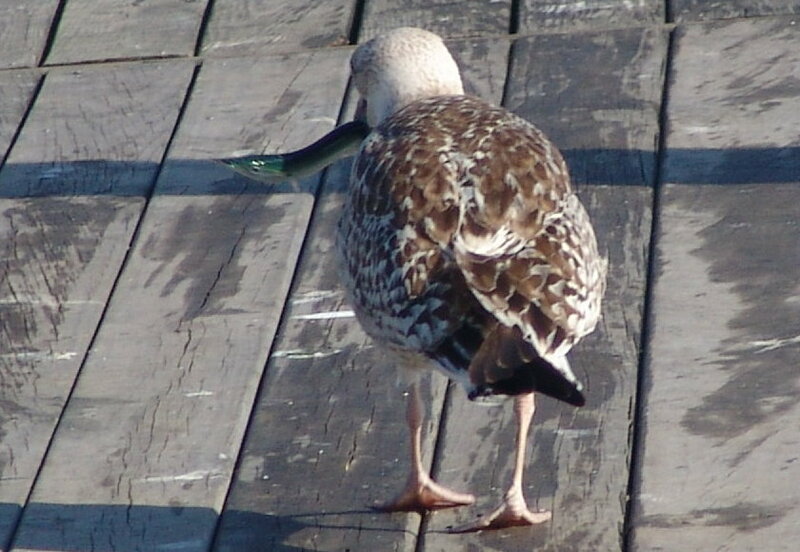 Humans eat large barnacles, scrape them from the bottoms of their boats and docks, and add fouling paint to keep them away. 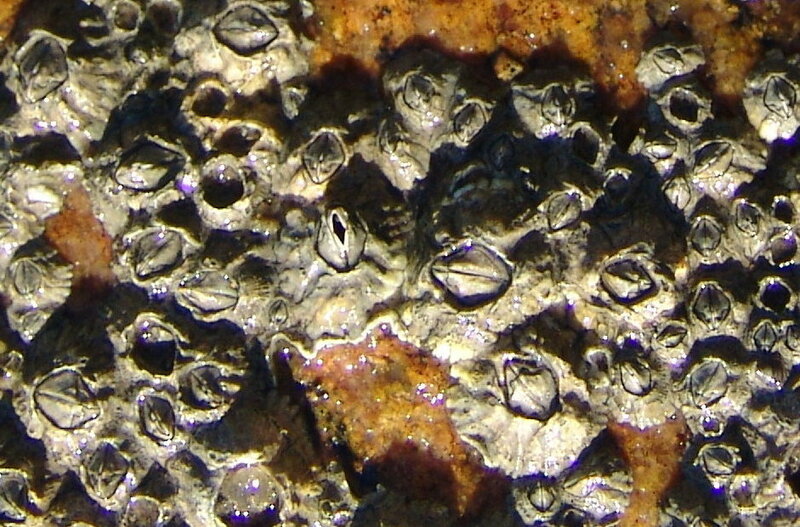 Fun factoid: Barnacles are crustacean just like crabs and lobsters, but that still won’t entice us to eat them. The Turtle Journal team offers a treat just in time for Halloween. In fact, we offer you four years of treats from the files of the Terrapin Diary, one of the web’s first nature blogs created the same year that the term “blog” itself was coined and long before “blogging” had entered the public consciousness. The Terrapin Diary began at the turn of the millennium as a collaboration between Don Lewis, the Turtle Guy, and Jim Van Abbema, The New York Turtle & Tortoise Society web master. 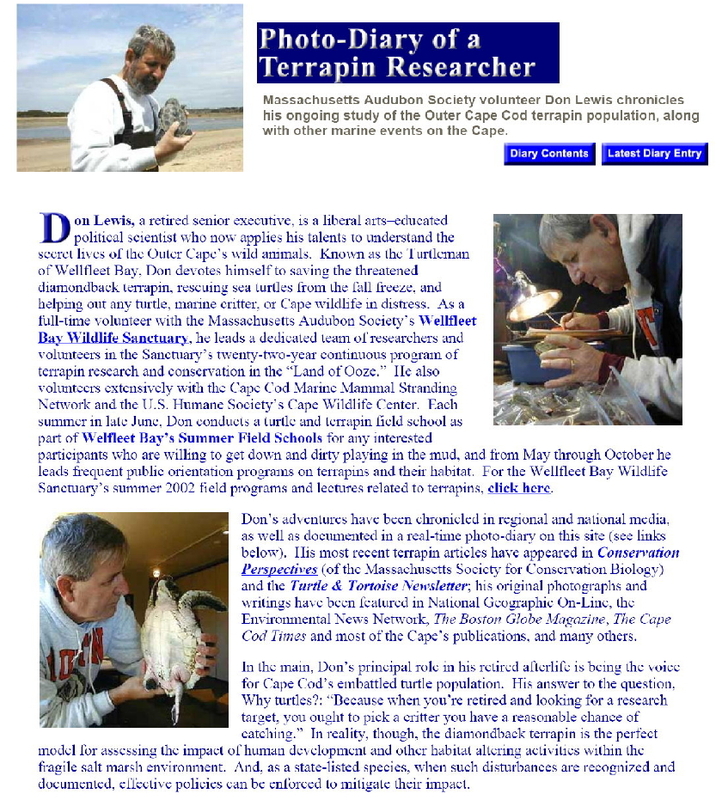 This seminal partnership between rural Cape Cod and metropolitan New York started shortly after the discovery of a massive die-off of diamondback terrapins during the winter of 1999 – 2000 and was sparked by the 2nd plenary diamondback terrapin symposium at the Wetlands Institute in Stone Harbor, New Jersey in October 2000. The Terrapin Diary posted natural history entries continuously for the next four years of wildlife research, conservation and rescue. Thanks to a reunion of that partnership, the Terrapin Diary has risen from the bit-bucket of digital history to be resurrected and mated with its successor, the Turtle Journal. The fully integrated Terrapin Diary – Turtle Journal now offers a decade of uninterrupted observations, illustrative stories, poignant anecdotes and scientific data about wildlife research, rescues and conservation along the Atlantic shoreline, with brief excursions into the Caribbean and other exotic ocean venues. For a stroll through the Terrapin Diary, click on the cover page below or any of the hypertexted titles above. Although you may get lost in time as you burrow deeply into those enticing stories and compelling images, we hope you’ll return to Turtle Journal to see what’s happening in the here and now right outside your virtual window into the natural world that surrounds us. Each of the Terrapin Diary entries from 2000 through 2003 have been integrated into the Turtle Journal index. If you’re looking for an event or a time period, click on the appropriate index on the right sidebar. We close this entry with a profound thanks to Jim Van Abbema who saved the Terrapin Diary digital files for the last five years and personally uploaded the archival material into the Turtle Journal web site, so that we could make it accessible to you. Nothing speaks Thanksgiving so well as a turkey’s gobble. 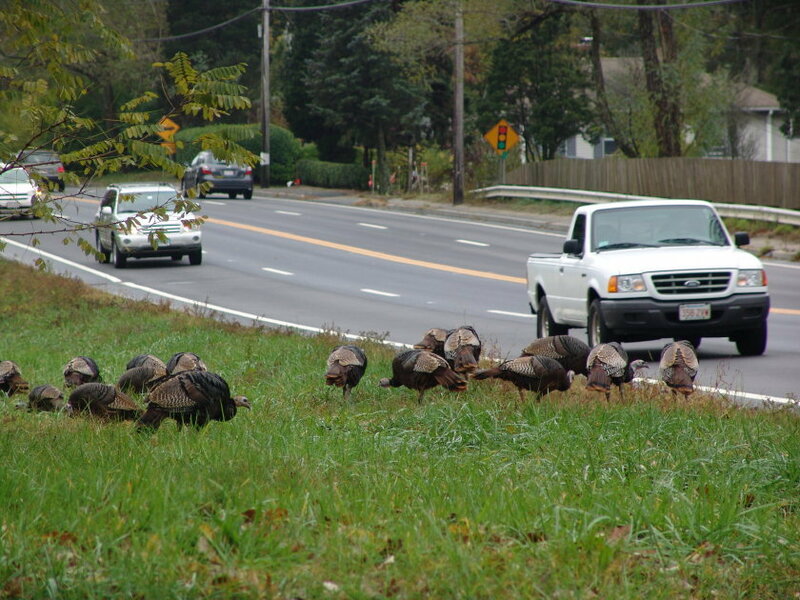 We may be a month away from this most original American feast, but the Turtle Journal team heard a raucous rendition of the Thanksgiving serenade as we drove through Eastham. A rafter of wild turkeys … 29 birds in all … pecked the edge of the main Cape Highway near Salt Pond. Engrossed in finding the juiciest morsels, they’d wander recklessly close to traffic, only to snap back as a car whizzed by within inches of their ears. Turkeys are, indeed, a courageous beast as asserted by Ben Franklin. When we think of wild turkeys, our vision is an idyllic woodsy scene where hints of large feathered images melt into the shadowed background. They are a mirage that evaporates as you approach. That’s precisely what we found the following day as we revisited the Salt Pond site. Yet, on Sunday, they clung to the roadway. Other than at a commercial turkey farm, the Turtle Journal team has never seen a rafter of 29 healthy and well-fed wild turkeys. The good news is clearly that efforts to protect these magnificent birds from over-hunting may be proving effective. The sadder news is that we have so fragmented wild habitat with asphalt roads and suburban landscaping that as populations begin to recover they’re compressed into micro-parcels and constantly find themselves in lethal danger from human activities. 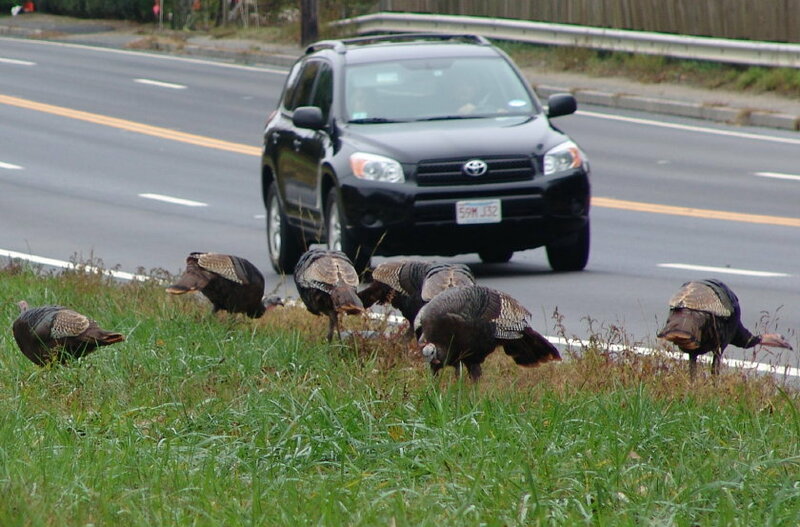 While all those conservation thoughts are true, they do not minimize the pure joy of seeing so many wild turkeys gobbling through the Eastham roadside. We spent about a half hour walking with the rafter as they worked the fields into a nearby woodlands. Once the highway buzz muted in the distance, you could imagine yourself back in Colonial America, right here on the Outer Cape where the Mayflower first dropped anchor before crossing to Plymouth. They, too, would have encountered wild turkeys foraging through open fields, but unlike us, they would have known nothing about these native American birds. Come to think of it, perhaps most Americans still have that ignorance in common with the Pilgrim pioneers. NATURAL HISTORY: Wild turkeys are beset by a wide range of predators throughout their lifecycle from egg through poult to adult. These predators include snakes, skunks, opossums, raccoons, coyotes, foxes, dogs, crows, hawks and owls. 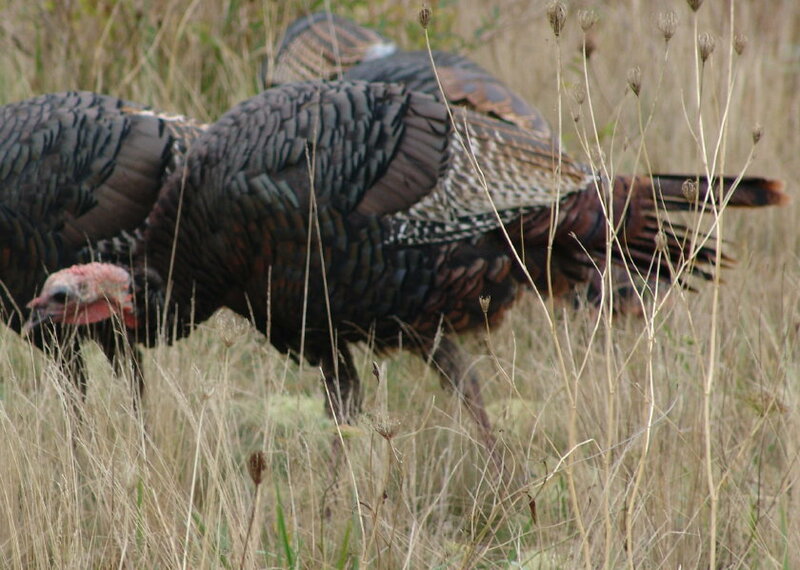 It would be interesting to know whether the recent upswing in wild turkey numbers on the Outer Cape stems from a reduction in natural predators within their preferred habitat. 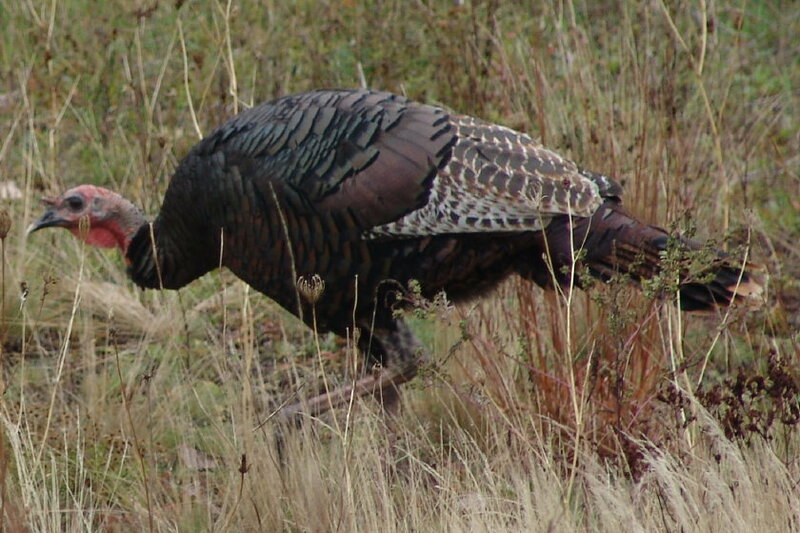 Wild turkeys like to forage along the ground within hardwood and mixed woodlands, but they can also be found in adjoining grasslands and swamps. Clearly, pre-Colonial Cape Cod would have offered a paradise for these birds with all their favorite foods in abundance: nuts, seeds, fruit, insects and even salamanders. 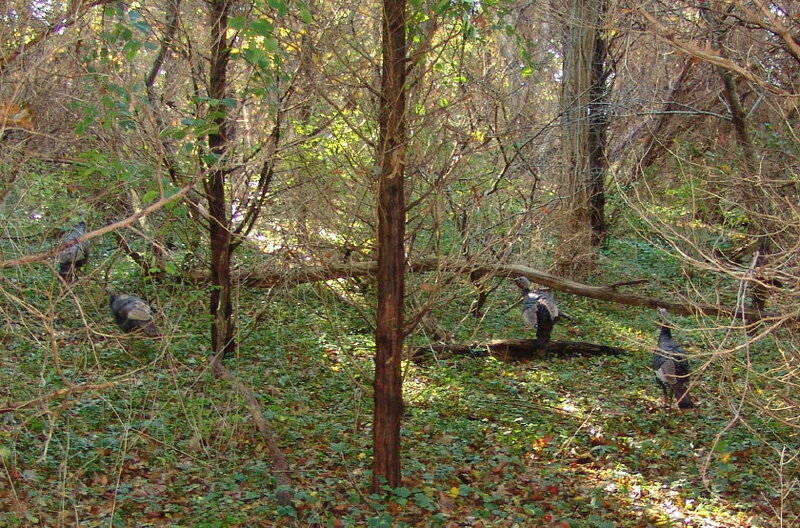 At night, wild turkeys may roost in trees. They build crude nests of dry leaves on the ground into which females (hens) lay clutches of 4 to 17 eggs. Almost twice the size of chicken eggs, they’re pale tan in color with dark brown speckles. Hens feed their chicks for only a few days after they hatch, for the young turkeys (poults) quickly learn to fend for themselves within mother-chick flocks of dozens of animals. 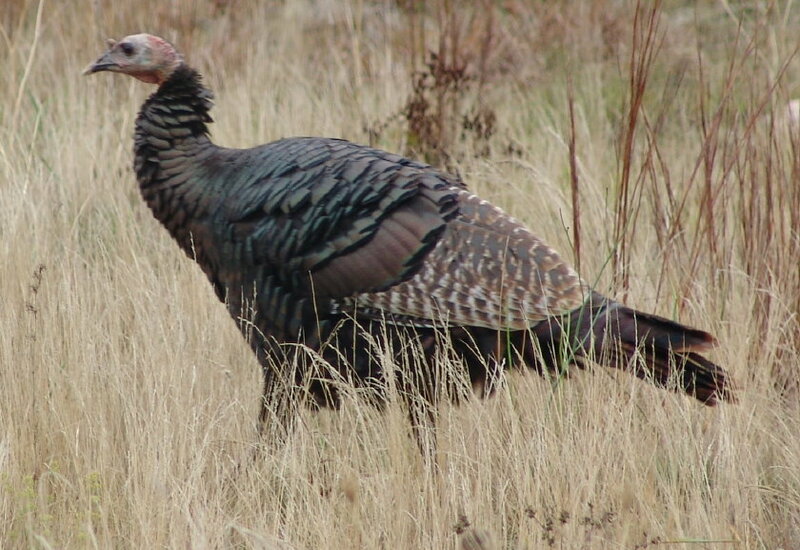 Males (toms or gobblers) take no role in rearing. Once the sky would darken as massive rafters of wild turkeys would spread their wings and fly in unison, according to natural historians. But in the early 1900s, wild turkey populations declined significantly throughout the United States due to habitat destruction and unregulated subsistence hunting. Reintroduction programs begain in the 1940s and the comeback of wild turkeys in North America is arguably one of the more successful conservation stories. Estimates today set the number of wild turkeys at more than 7 million in the United States, Canada and Mexico. On the downside, nearly half of jurisdictions with wild turkey populations lack a management plan, and less than half of existing plans incorporate habitat management or land protection. 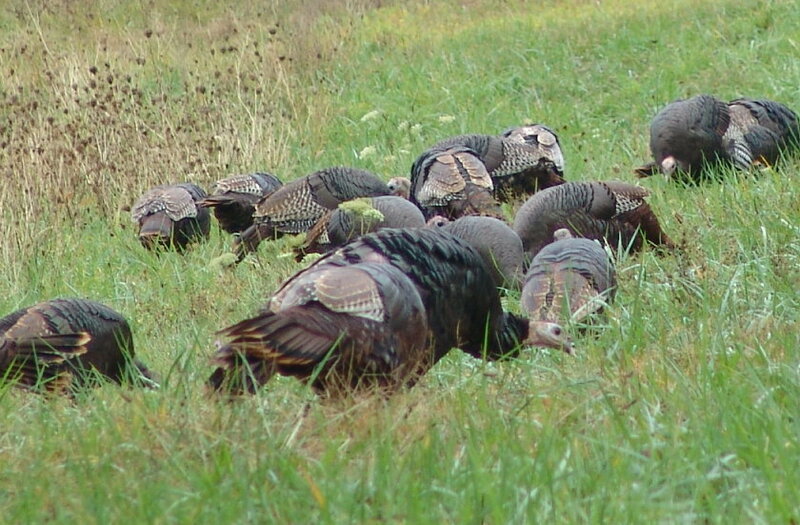 These deficiencies spotlight key conservation goals to preserve a healthy and viable wild turkey population for future generations. While clearly not party to any conservation program, Astronauts Neil Armstrong and Edwin Aldrin of Apollo 11 dined on turkey in foil packets as their first meal on the moon. Since we’re back here in 21st Century America, if you’re driving north to the Outer Cape on Route 6 through Eastham, be careful as you round the bend after Windmill Green, slow down once you see Salt Pond on your right, and watch out for an American original: the magnificent and courageous wild turkey. 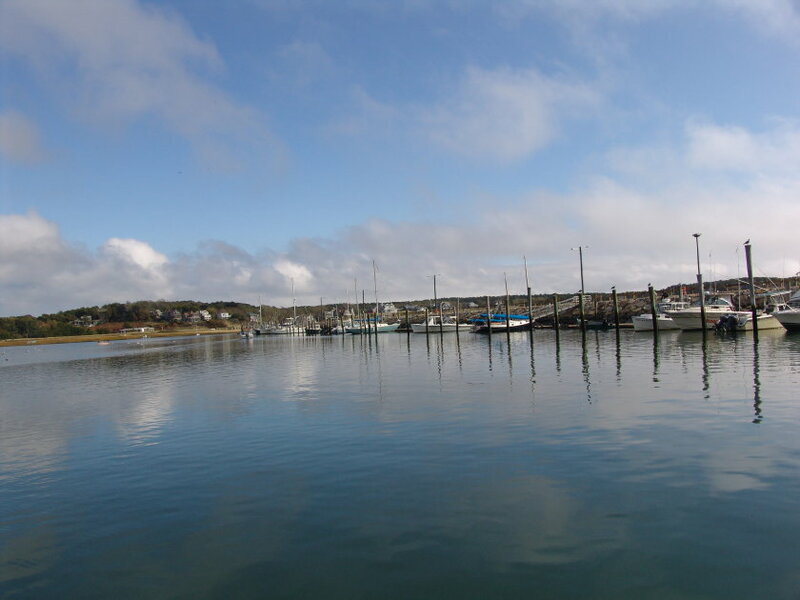 The day showed Wellfleet Harbor at its exquisite best … not just for mere humans, but for sealife that calls the Outer Cape home, too. As we arrived the tide was dropping quickly from mid to low. Streams of small fish such as sand eels flooded the inner harbor among the floating small boat docks. The harbor was filled with seagulls everywhere. 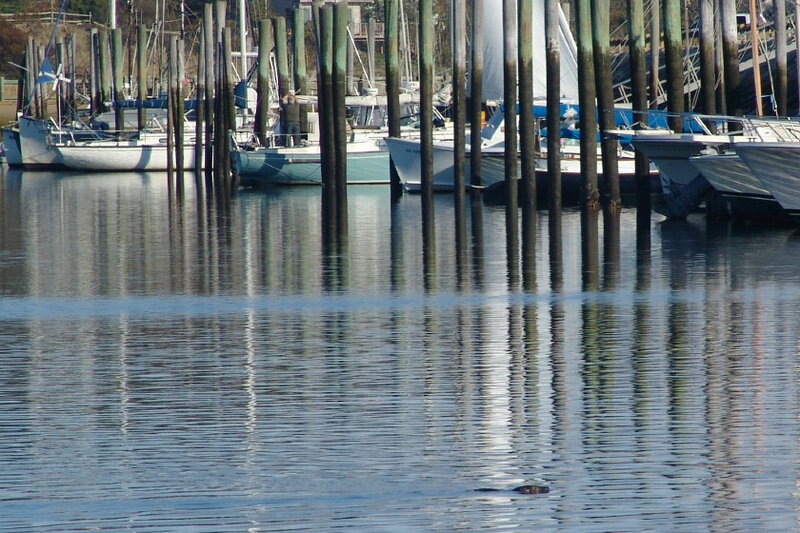 Mostly they rested on pilings, on boats, on docks, on water, barely moving a muscle as they warmed in the sunshine. Between these long stretches of laziness they would screech into action whenever a cormorant snagged a fish. They lunged at the lucky cormorant, squealing, “Mine, mine, mine,” as depicted in Finding Nemo. Watching the ebb and flow of the seagulls, we noticed that not all cormorants were cormorants. Seals! 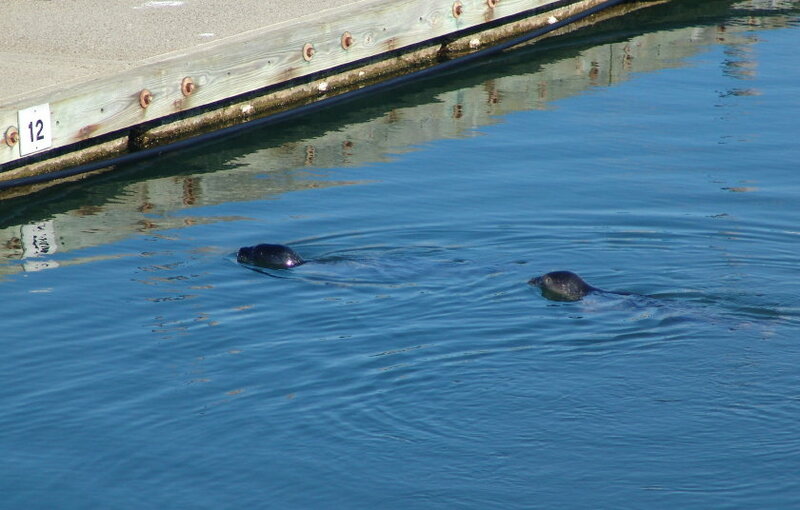 We were shocked to find three harbor seals fishing along the docks. They, too, would sprint after schools of fish, scoff down as many as they could consume in one spurt of activity, then retire to the rocky seawall or the sloping salt marsh banks to bask for a few minutes … before resuming the hunt. NEVER disturb a marine mammal. Seals have both excellent eyesight and hearing. Be respectful and observe marine mammals from a distance, so as not to interfere. Use a telephoto lens for photography and keep quiet. If you find an injured marine mammal in the Cape Cod area, call the 24/7 stranding hotline at 508-743-9548. Do not approach the animal without appropriate authorization. If you have trouble reaching someone, you can can always call the Turtle Journal 24/7 hotline at 508-274-5108. 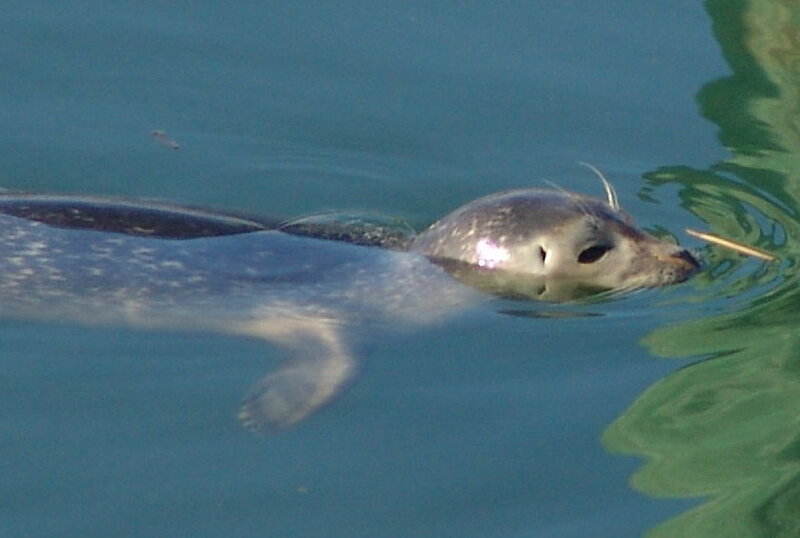 Harbor seals (Phoca vitulina) are small marine mammals mostly in the 3 to 4 foot range. They love fish, including sand eels (sand lances), herring, flounder, rock fish, but they’ll settle for squid or crustaceans or mollusks. They love to eat, and eat, and eat. Adult seals consume 5% to 6% of their body weight each and every day. So, when seals find a plentiful source of delicious fish, they’ll stick around. We saw these same seals the next day, Monday, waiting for the tide to drop low enough to simplify the hunt. Predators of harbor seals include sharks. (You don’t think that blue shark, see Yikes! 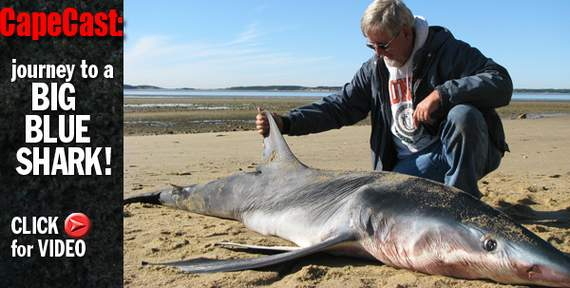 11-Foot Blue Shark in Wellfleet Bay, could have been after these cute critters, do you?) As pups they are preyed upon by coyotes, foxes and large birds. 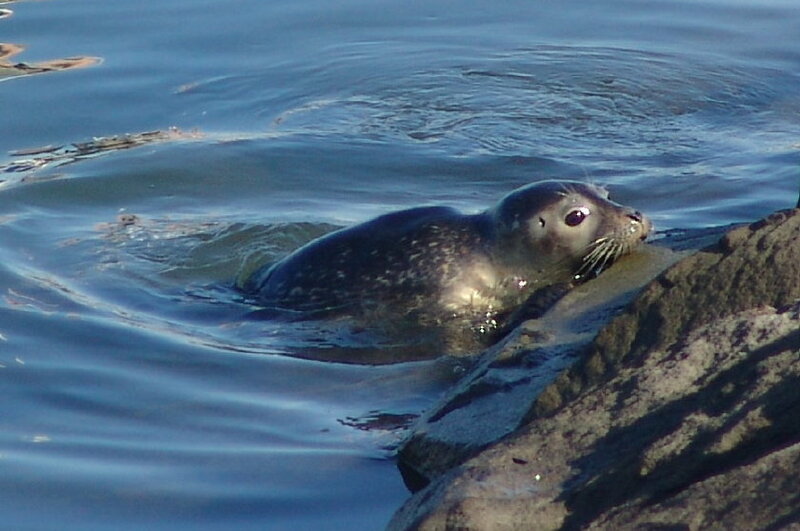 Harbor seals favor estuarine shallows, including sand bars, rock jetties, rocky reefs and mud flats. 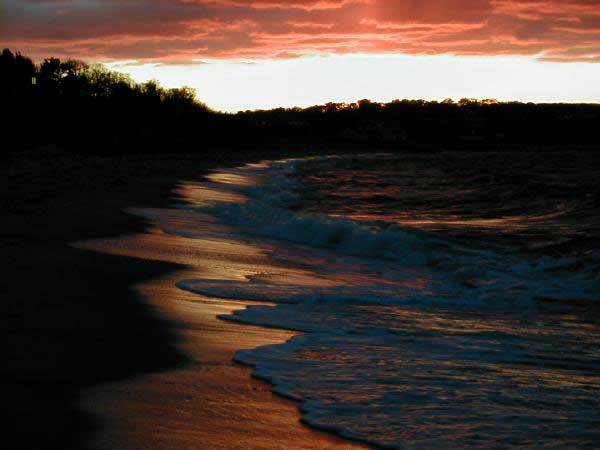 Locally, we expect to find them across Wellfleet Bay at Jeremy Point and along Monomoy Island in Chatham. They like to haul out to rest, to bask, to mate, to nurse, to molt and to digest. Our three critters picked options 1, 2 and 6 (rest, bask and digest). But one of our seals had an additional reason to haul out, and not a good one. While the inner harbor seems idyllic for these small mammals, the amount of boat engine traffic is high at this time of year as owners go out for their final cruise around the bay and motor over to the haul-out ramp to remove their boats for the winter. One of the seals, the smallest one, showed a propeller gash on its back, very raw and quite fresh. This seal fished and swam with the others, but appeared to tire more quickly and hauled out more frequently. The Wellfleet Bay Wildlife Sanctuary was informed of the injured animal and they reported that the Cape Cod Mammal Stranding Network had been informed of its injury. 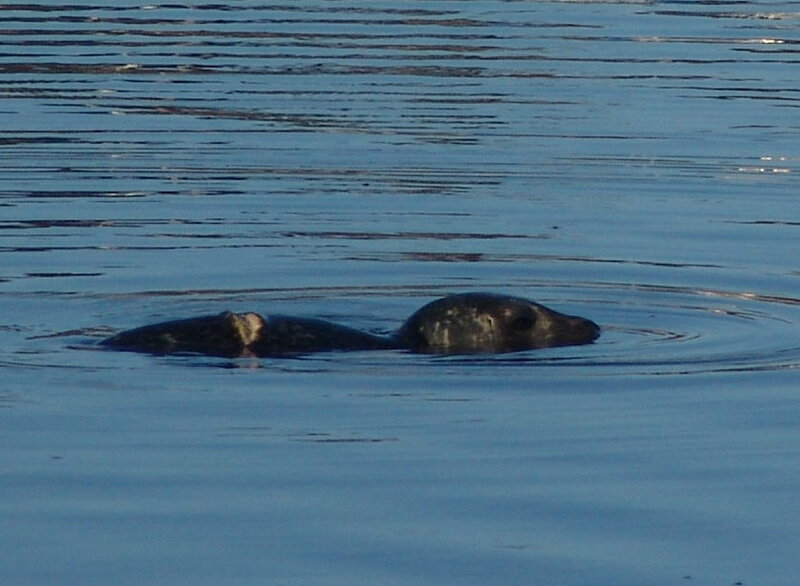 When we came back to Wellfleet Harbor on Monday, we saw the two larger, healthy seals swimming around and waiting for the tide to drop, but we did not detect the smaller, injured animal. Admittedly, we did not stay long enough on the second day for a comprehensive and definitive search. Not only the seals got their fill of fish. Cormorants fished along side the seals and caught their share. And seagulls hung around the edges to steal some portion of the catch. Since we spotted not a single thin seagulls, the Turtle Team assesses that they’re doing just fine, thank you. Journey to a BIG BLUE SHARK! CapeCast: Big, dead blue shark! On today’s CapeCast: See video of a nearly eleven-foot-long blue shark that washed up on Lieutenant Island in Wellfleet! You are currently browsing the Turtle Journal blog archives for October, 2008.